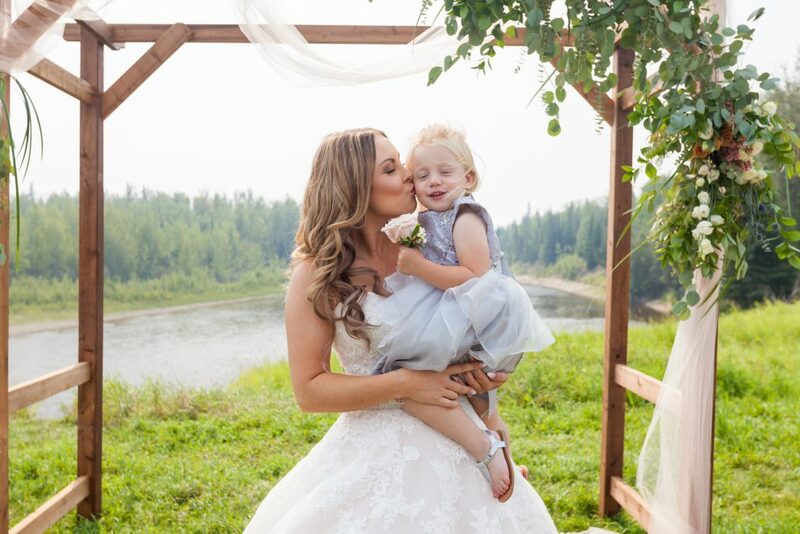 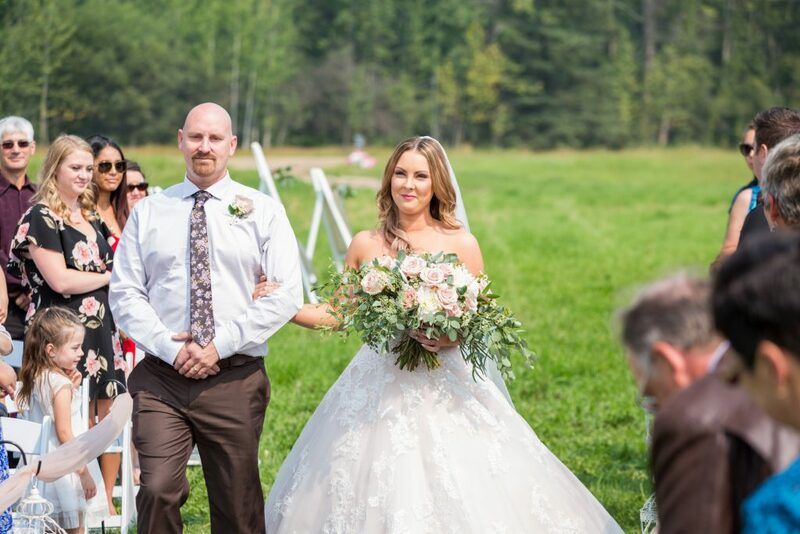 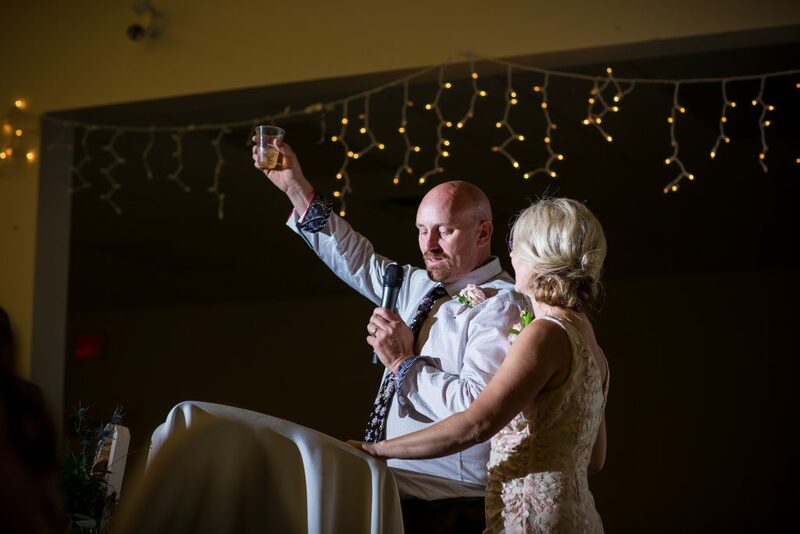 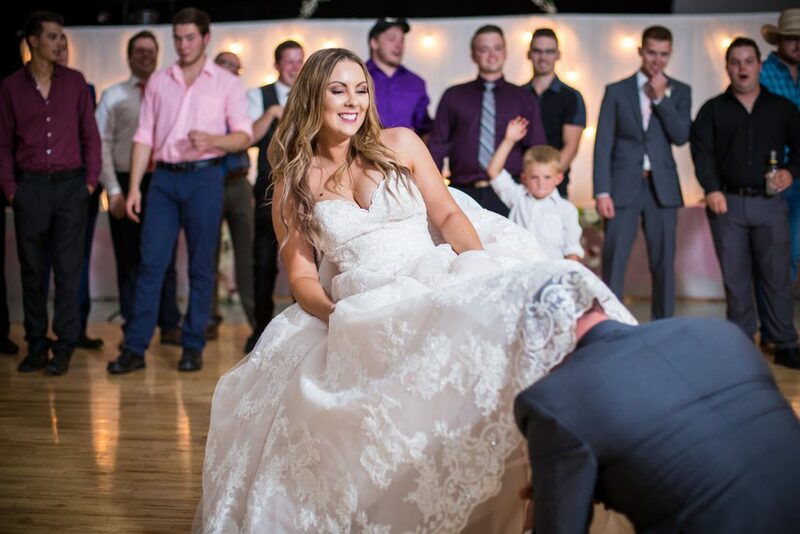 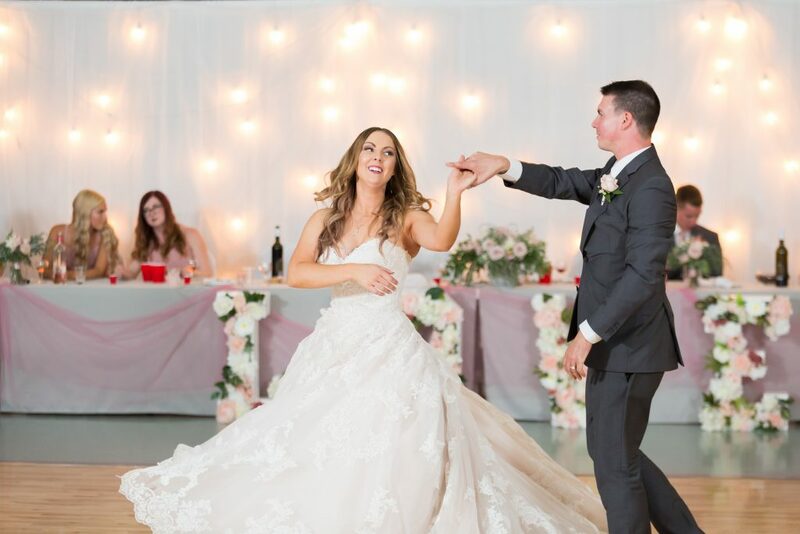 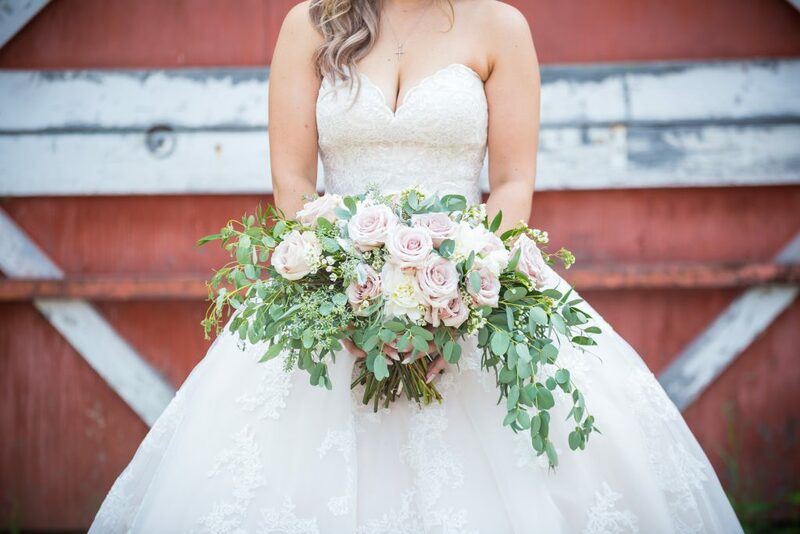 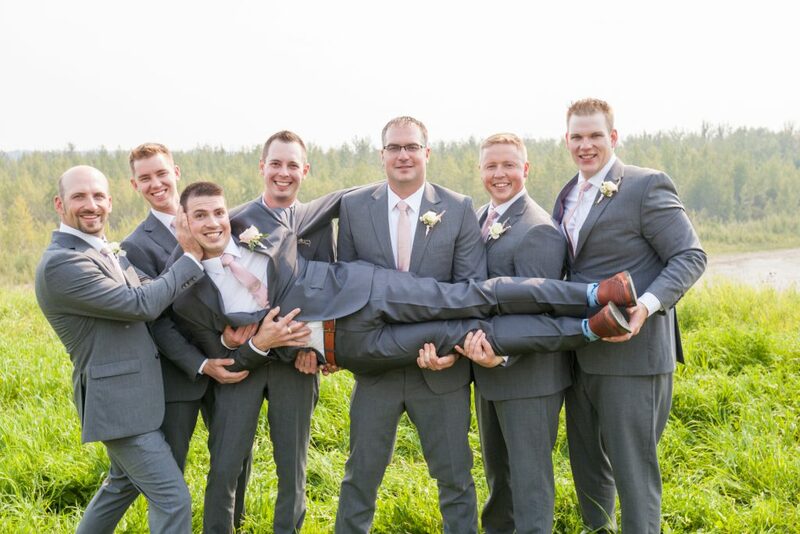 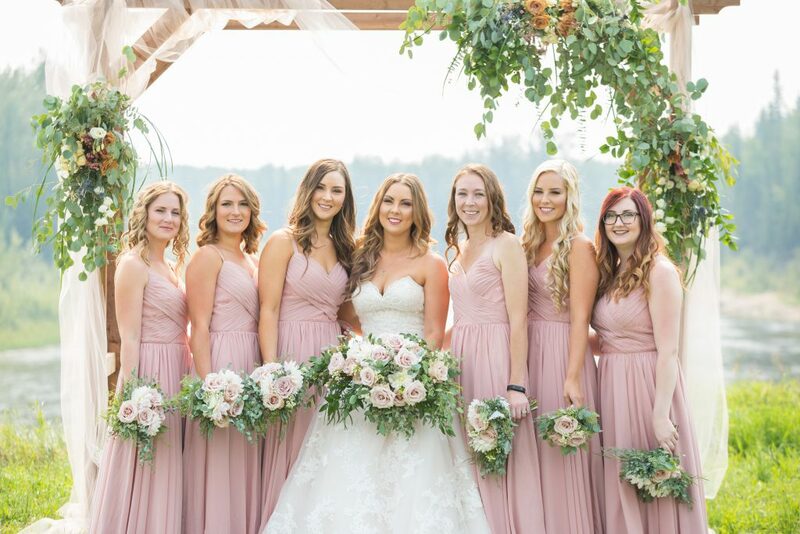 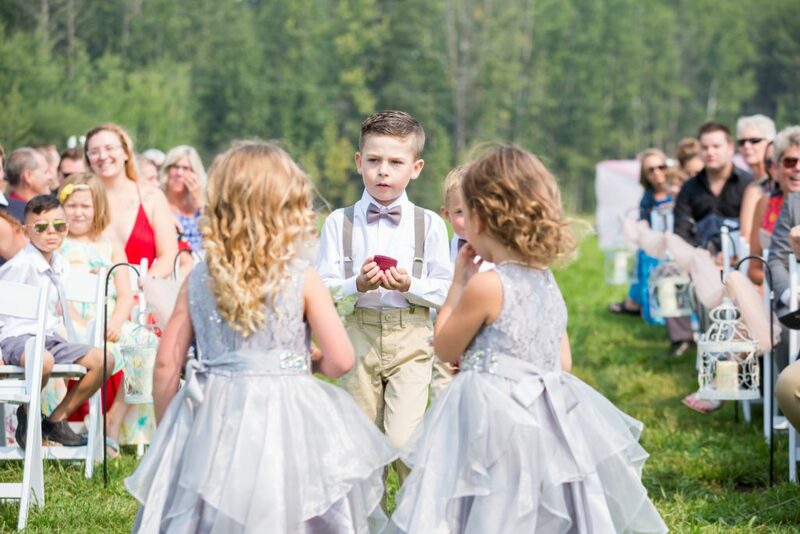 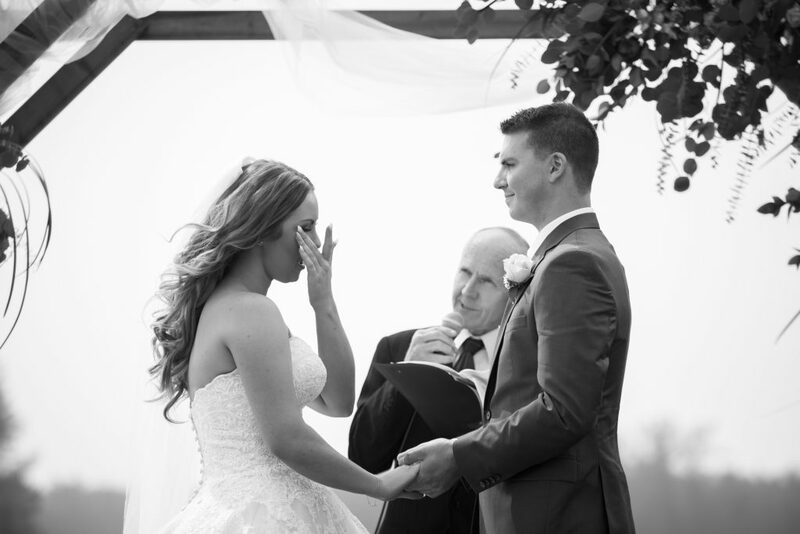 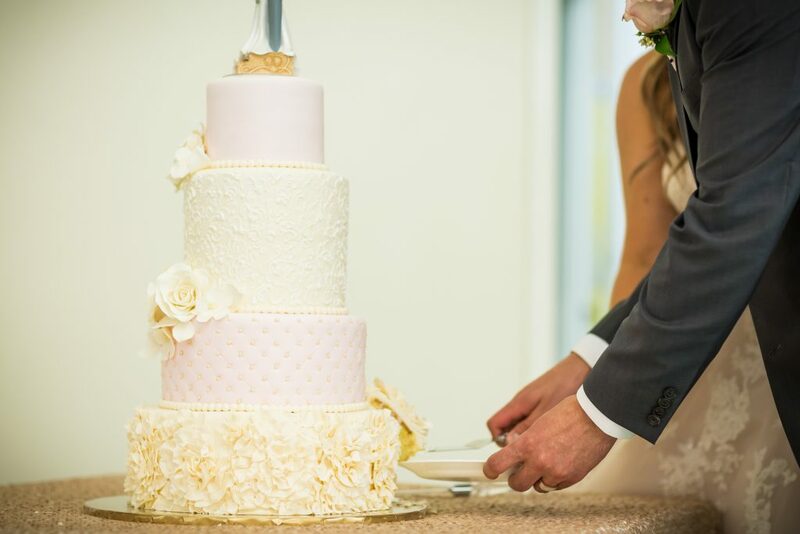 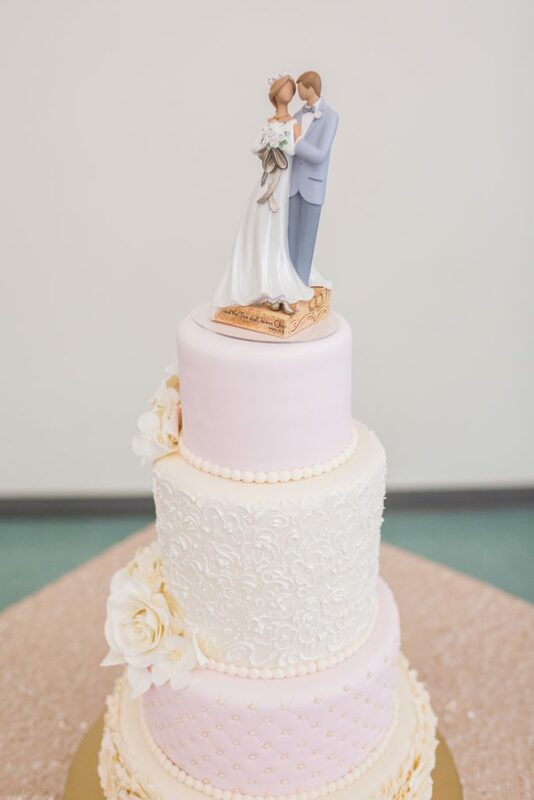 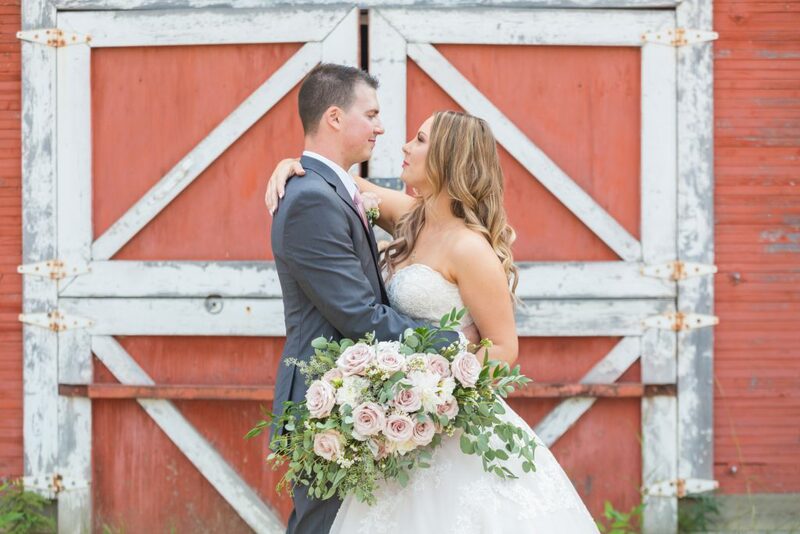 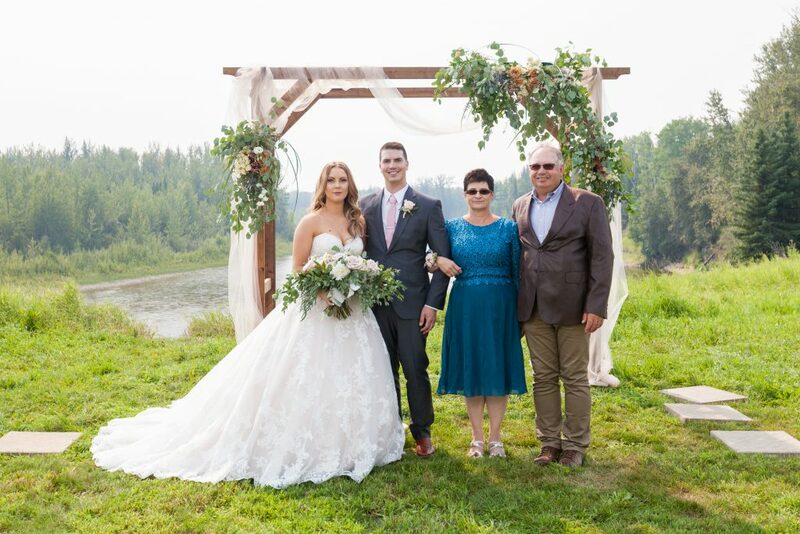 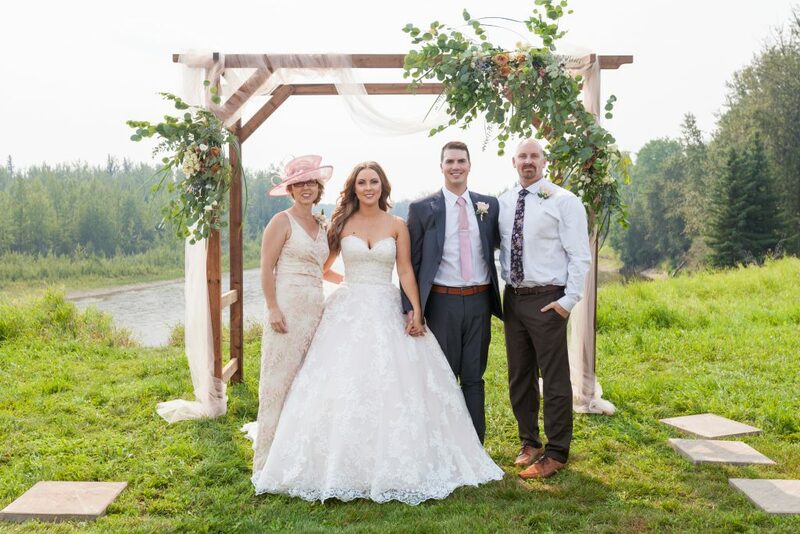 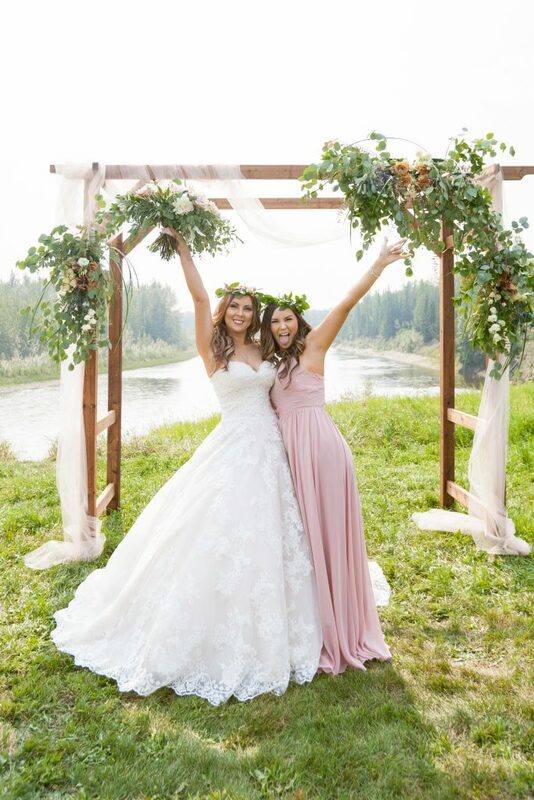 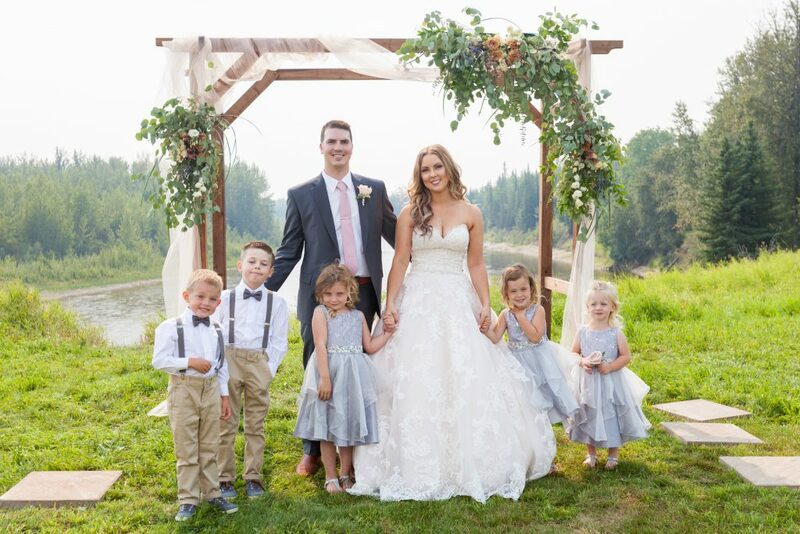 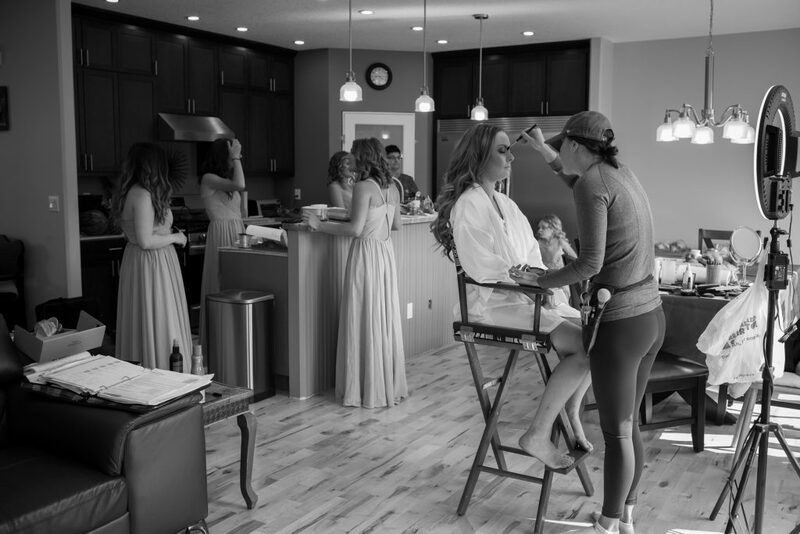 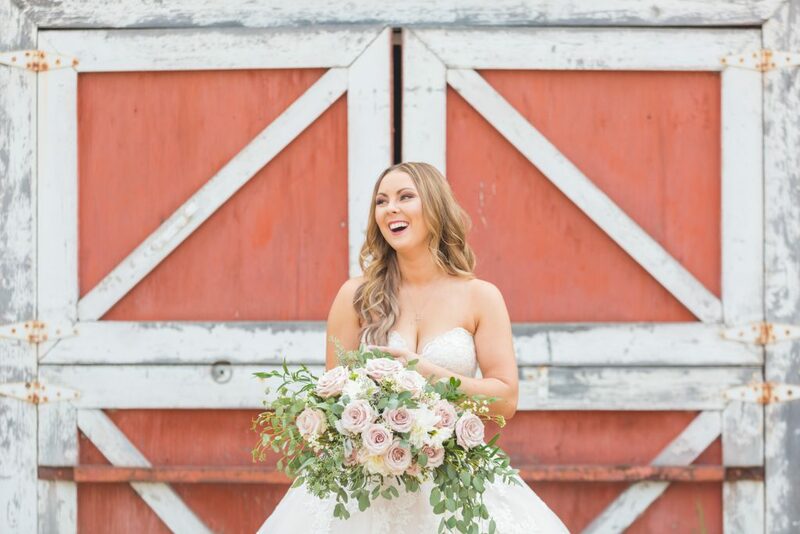 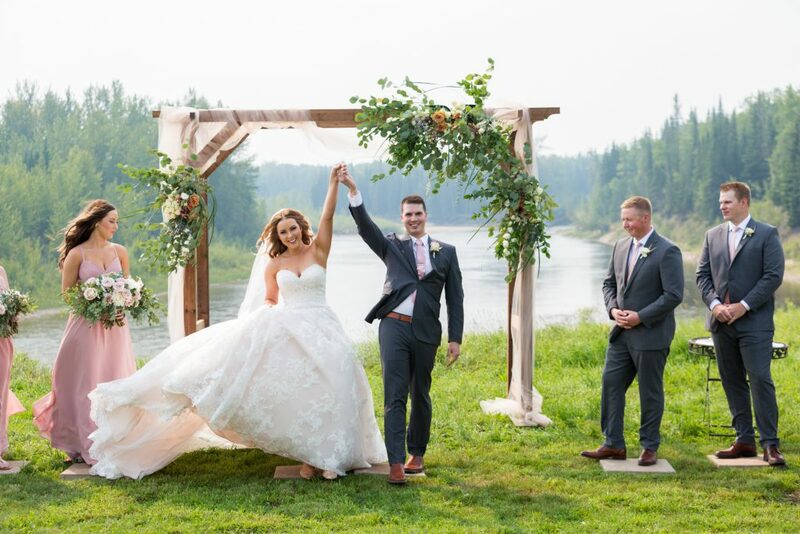 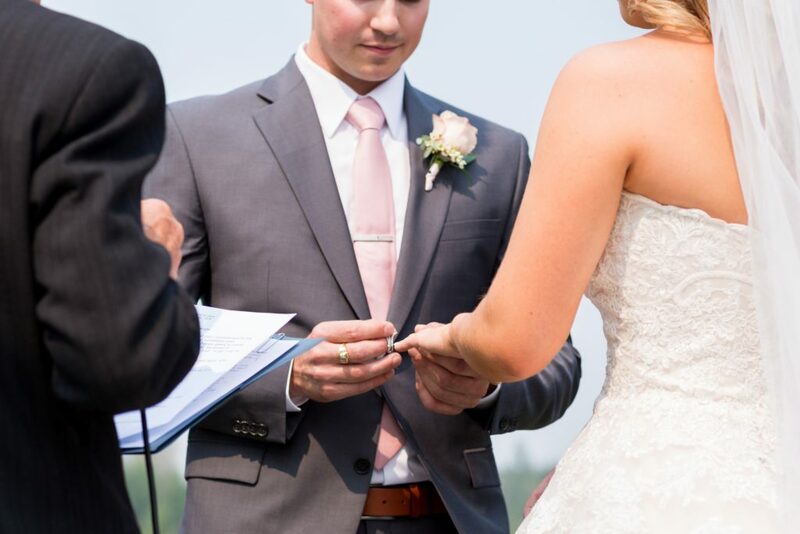 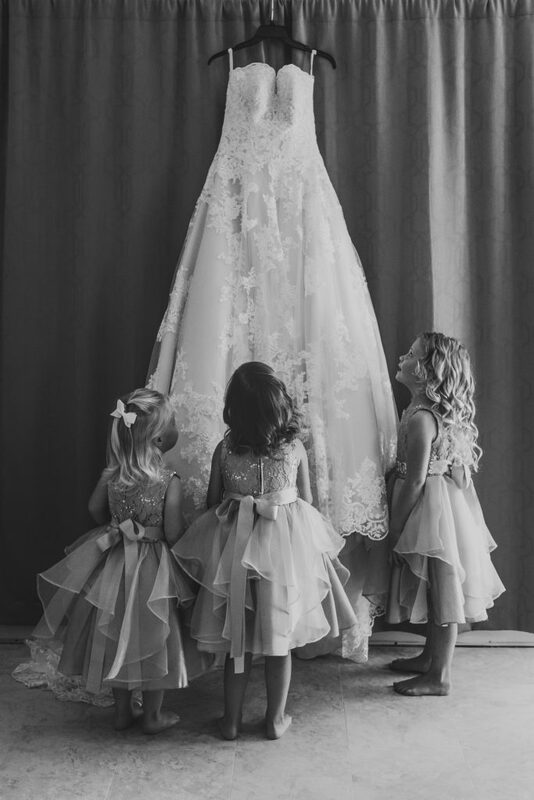 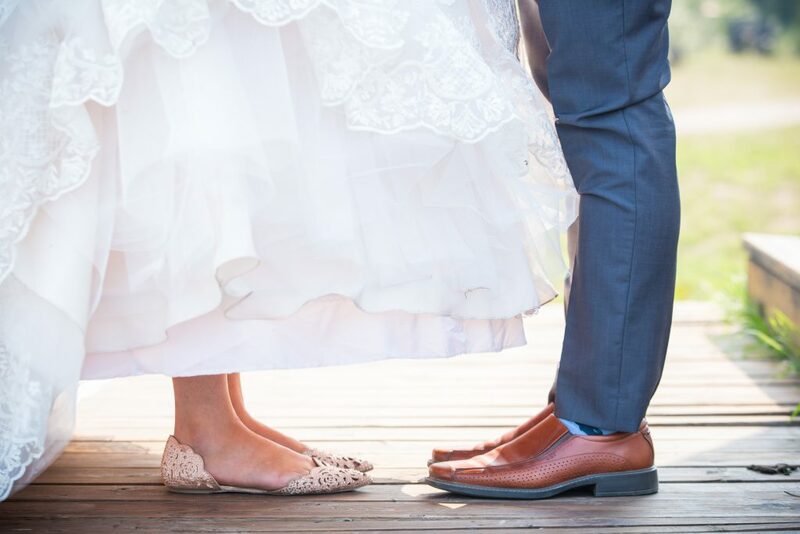 This stunning Whitecourt country wedding was both rustic and elegant. 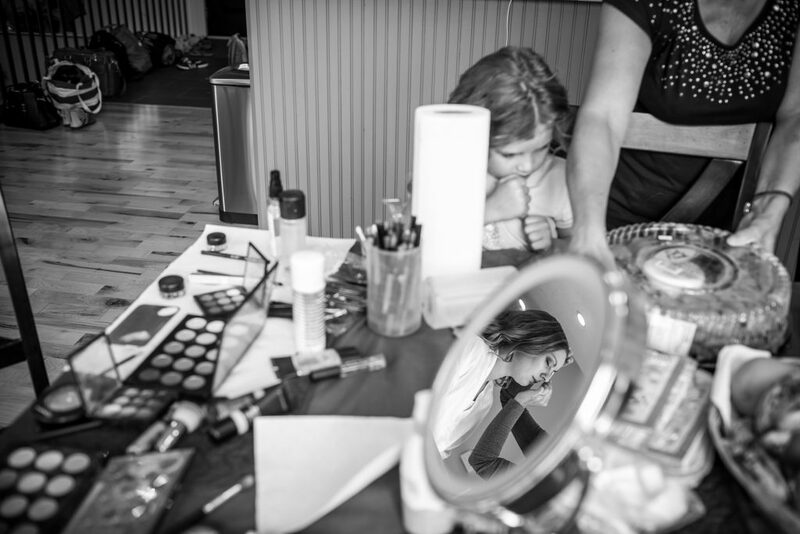 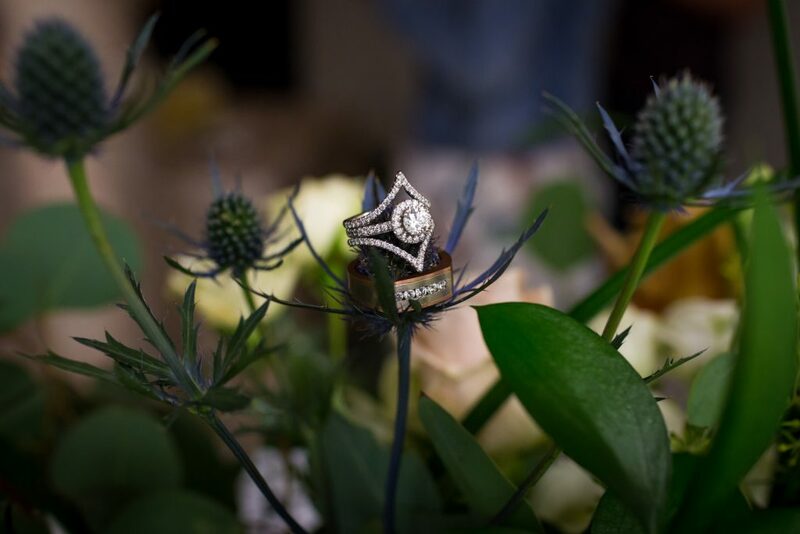 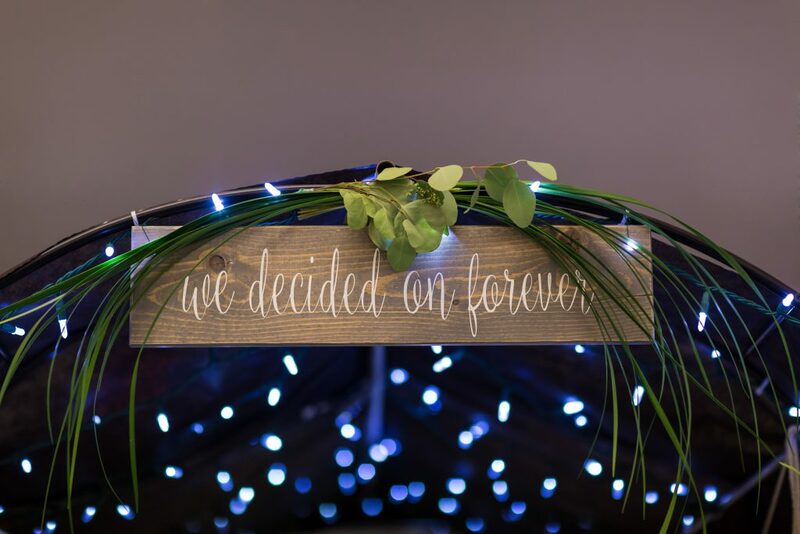 Raymond and Lierin thought through all of those tiny beautiful details that make a wedding truly sparkle. 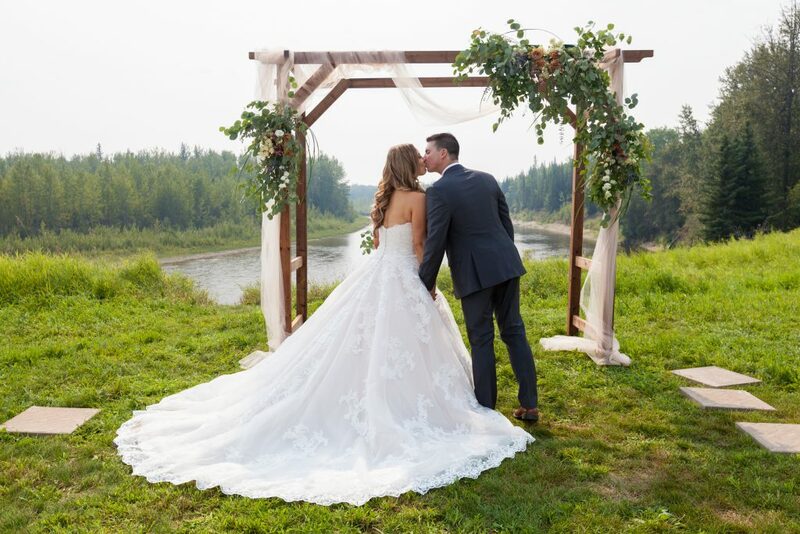 Whitecourt is a hidden gem, located about two hours north of Edmonton and surrounded endless miles of forestland. 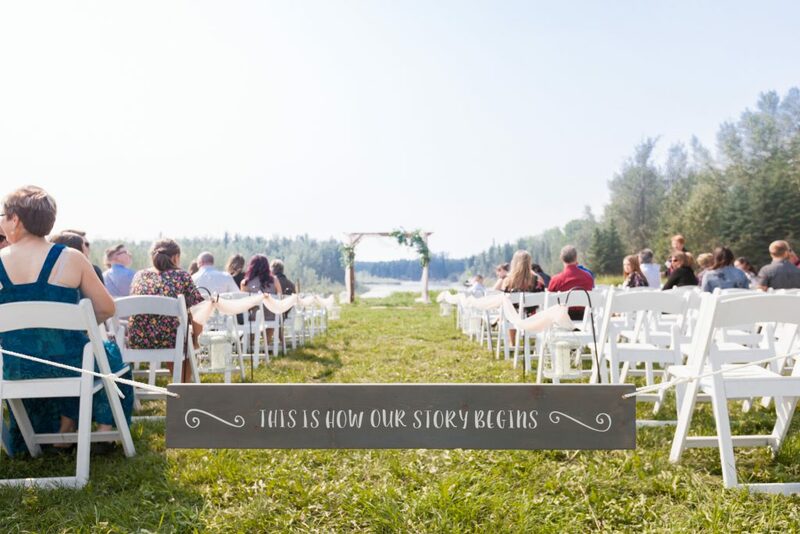 The rolling countryside is cut by the mighty Athabasca River whose many streams and spurs provide a breathtaking backdrop. 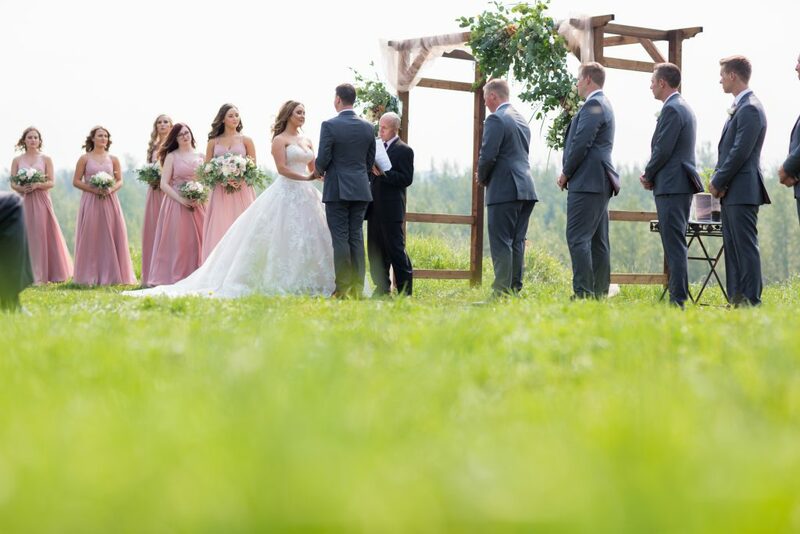 Raymond and Lierin embraced their love of this untamed country by holding their wedding ceremony in a freshly cut field. 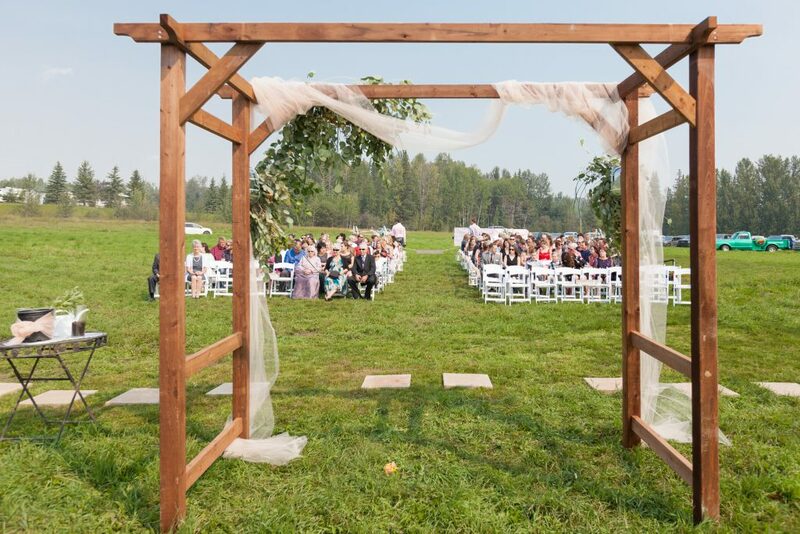 The area of the field backed onto the Athabasca river valley, where the bend in the river wrapped right around the ceremony location. 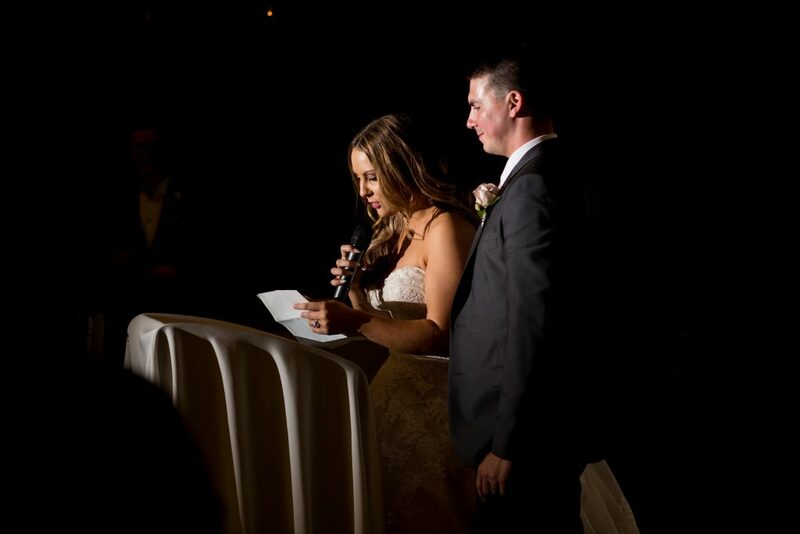 The ceremony was soft and romantic, with both Raymond and Lierin preparing hand written vows for each other. 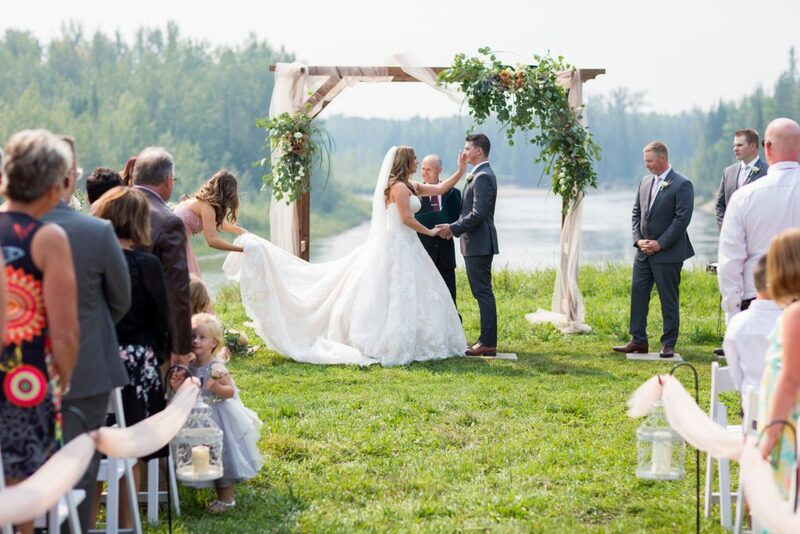 As a symbol of their union, the newlyweds planted a small tree as part of their ceremony. 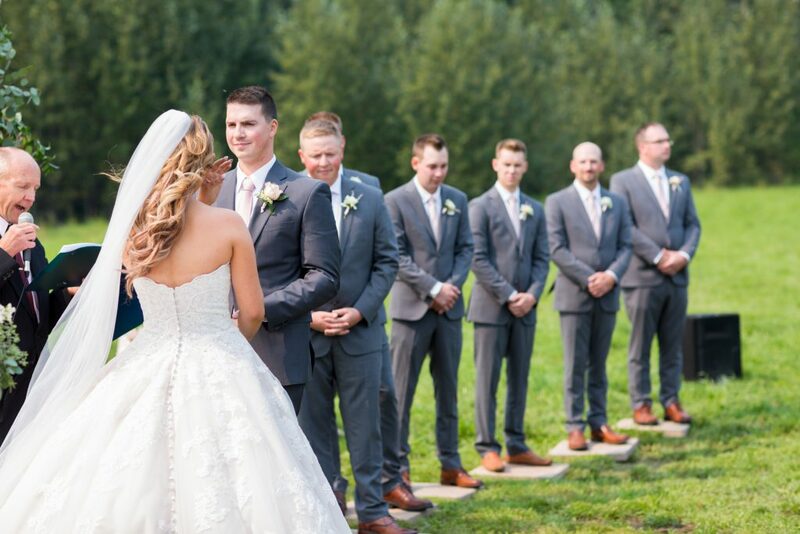 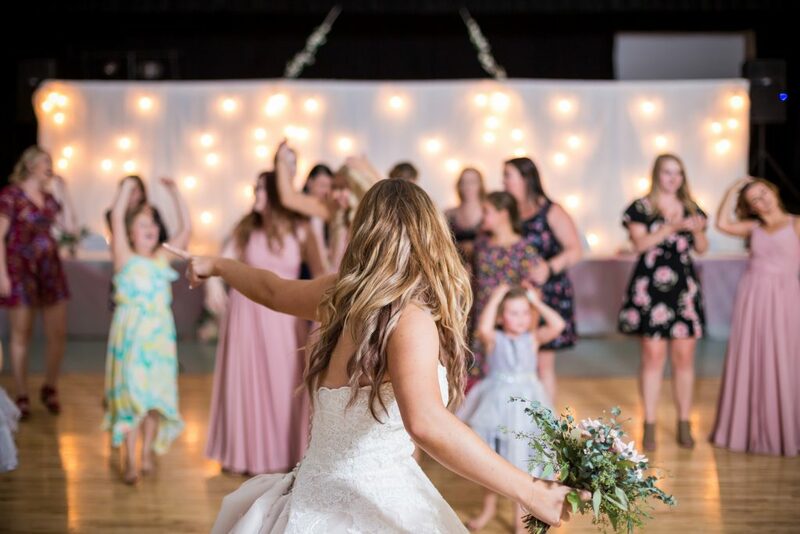 Family and friends cheered with elation as the newly married husband and wife took their first steps together down the aisle. 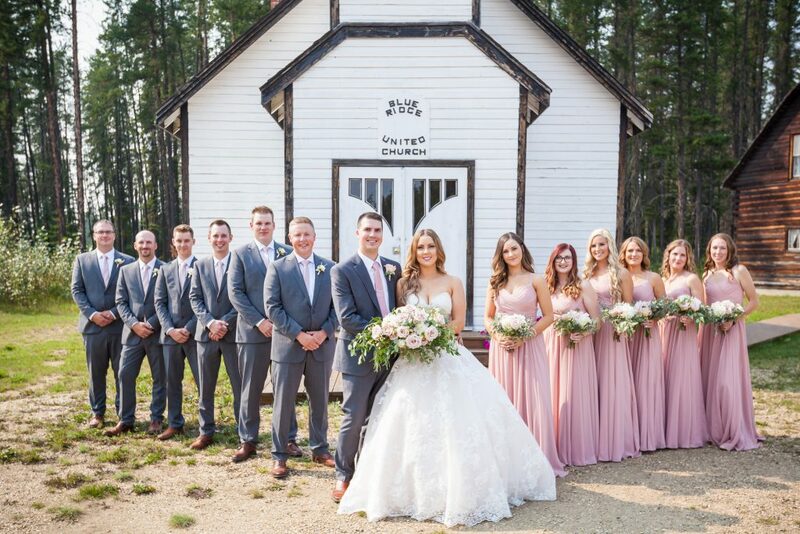 The wedding party got the celebration started early with a quick stop at a local pub. 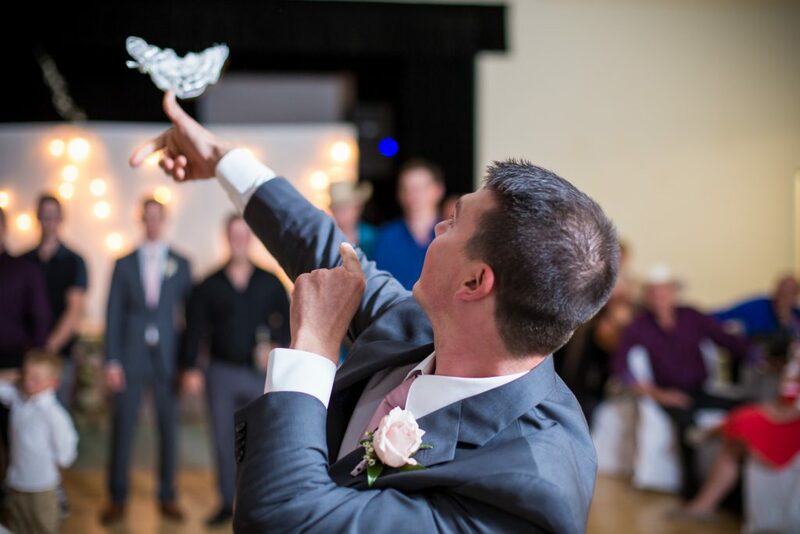 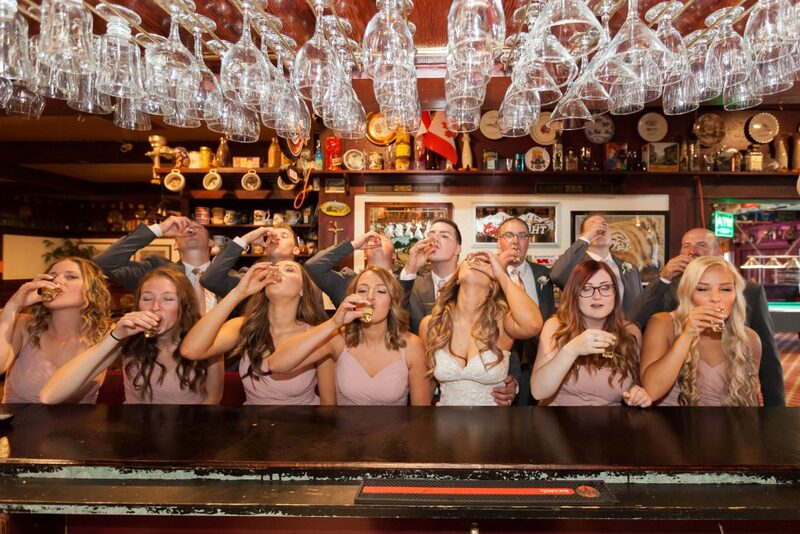 The bride and groom shared a few rounds of shots with their wedding party. 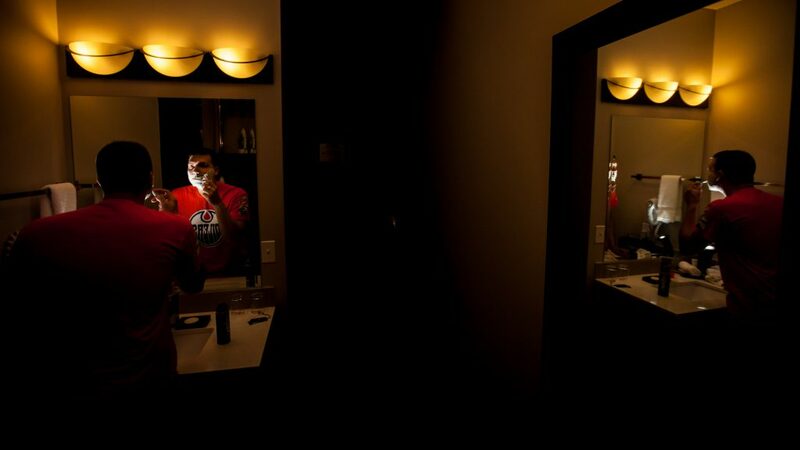 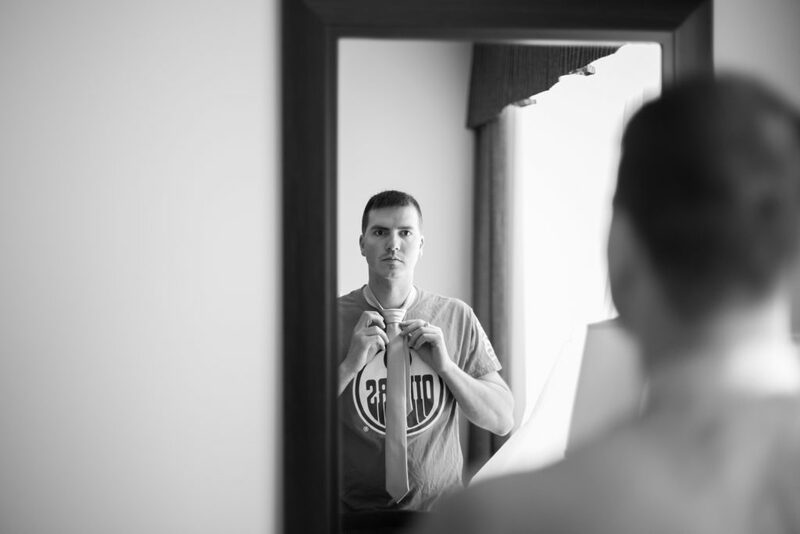 We always suggest to couples that they plan their portrait session time however they want. 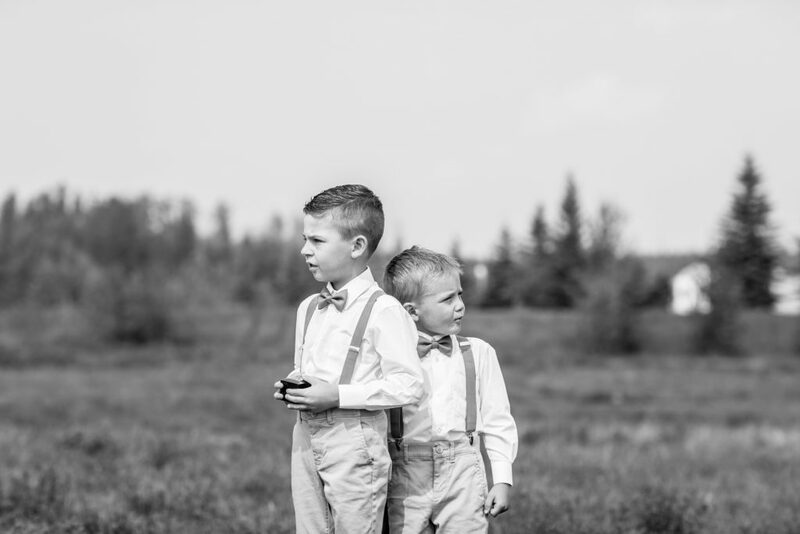 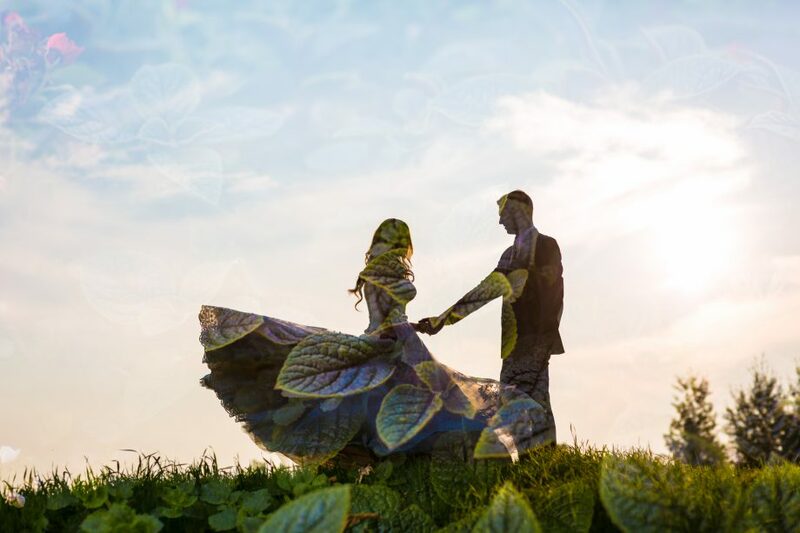 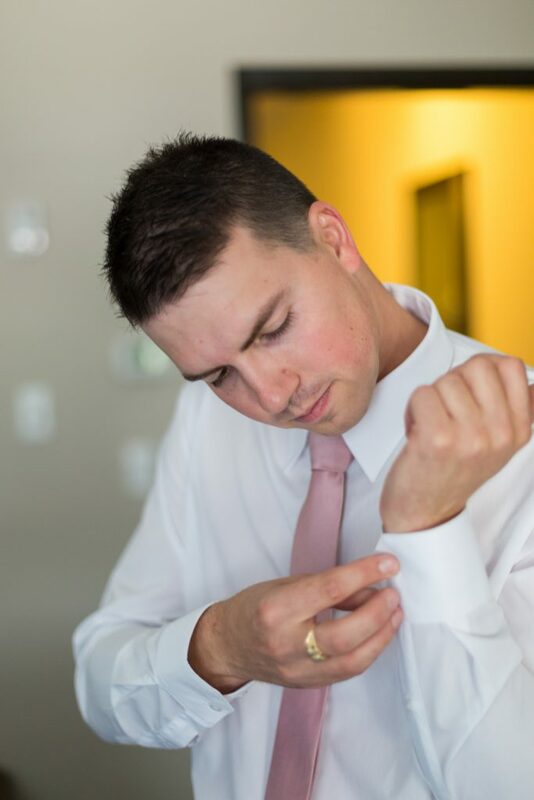 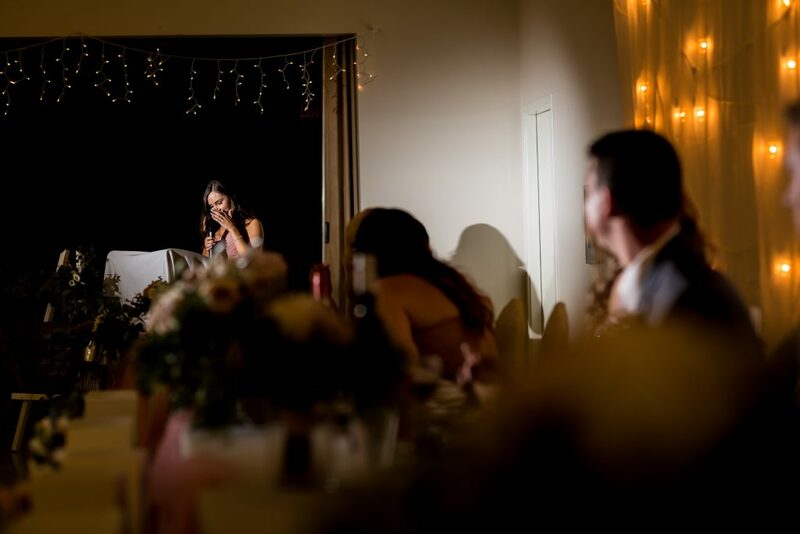 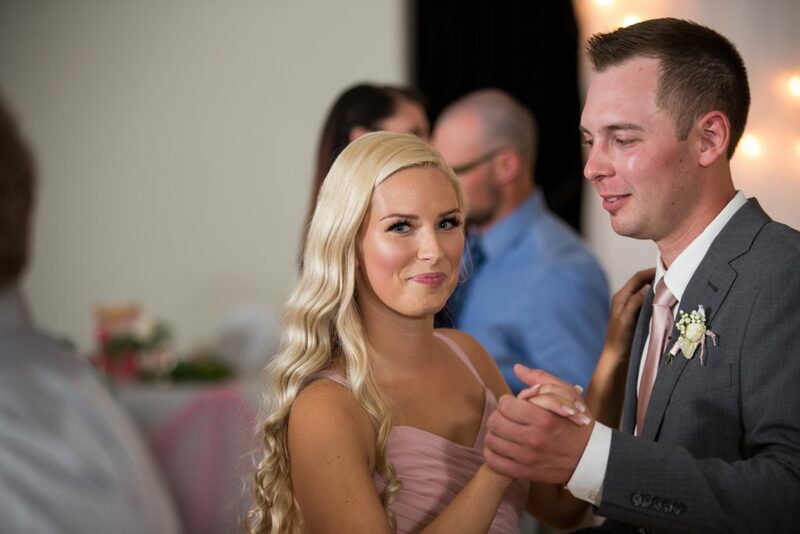 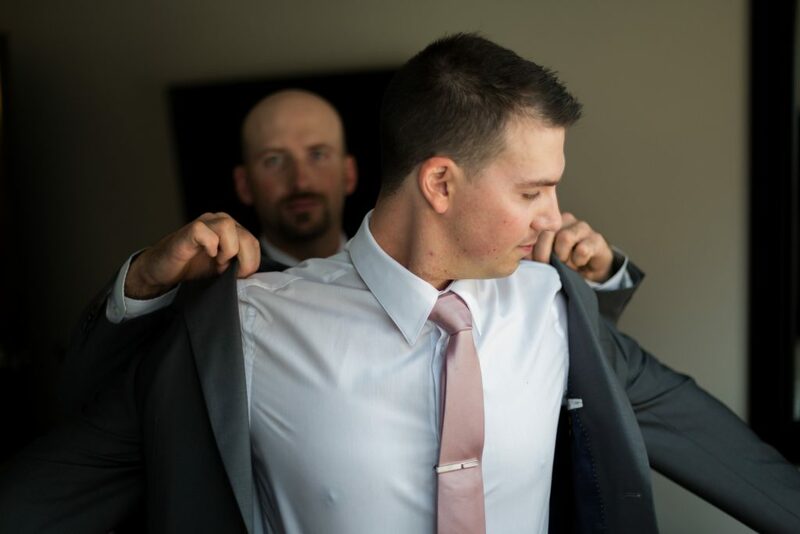 Whether it is a formal portrait session at a beautiful manicured park or stopping for a pint at your favourite drinking establishment, your photos are about your wedding day. 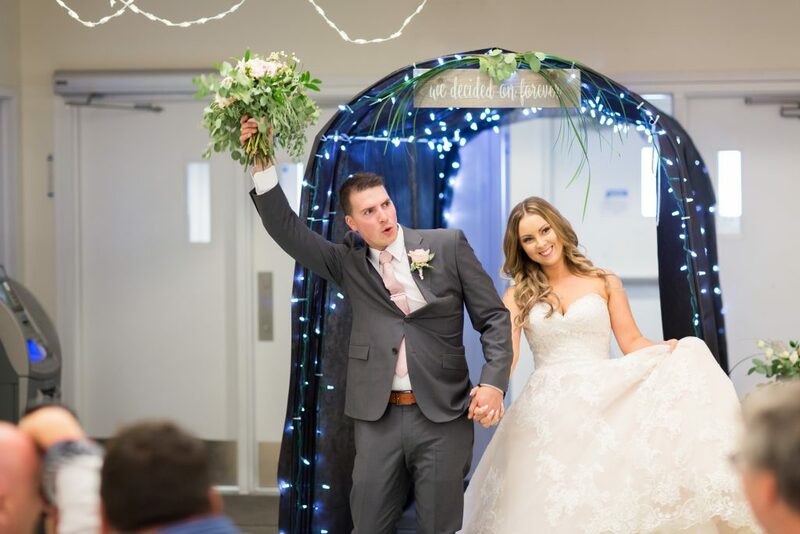 Family and friends greeted the newlyweds and the wedding party as they made their entrance into the reception. 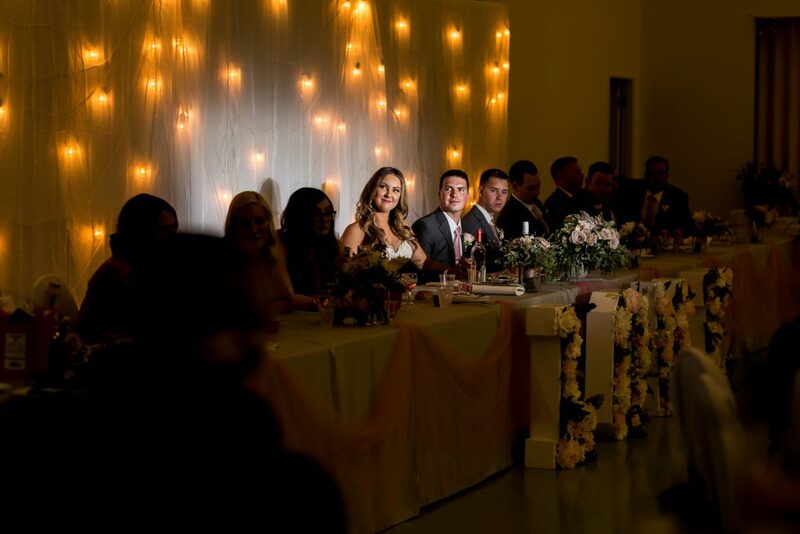 The wedding reception was held at the Westward Community Centre. 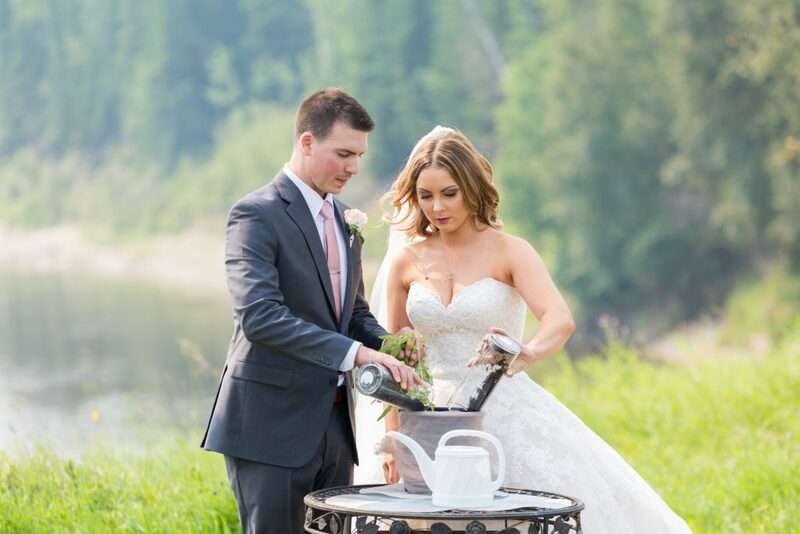 As the sun began Raymond and Lierin took a few minutes outside to relax and take in their wedding day. 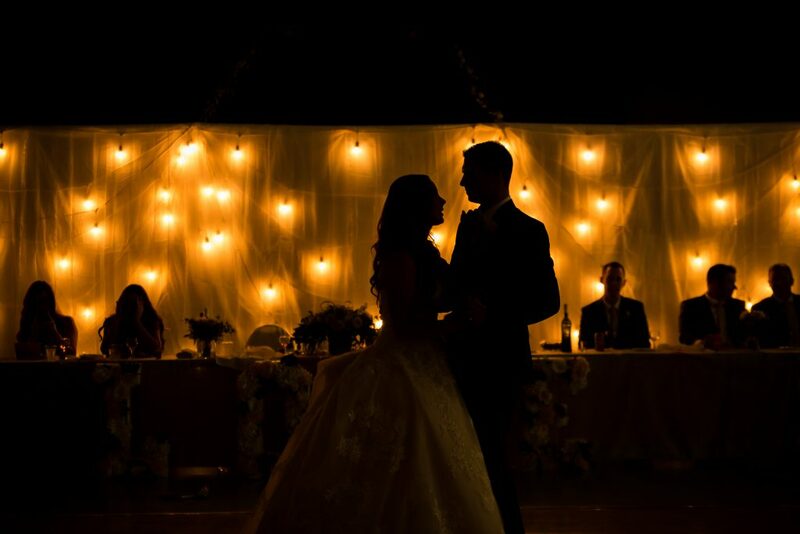 The soft and romantic sunset light was perfect. 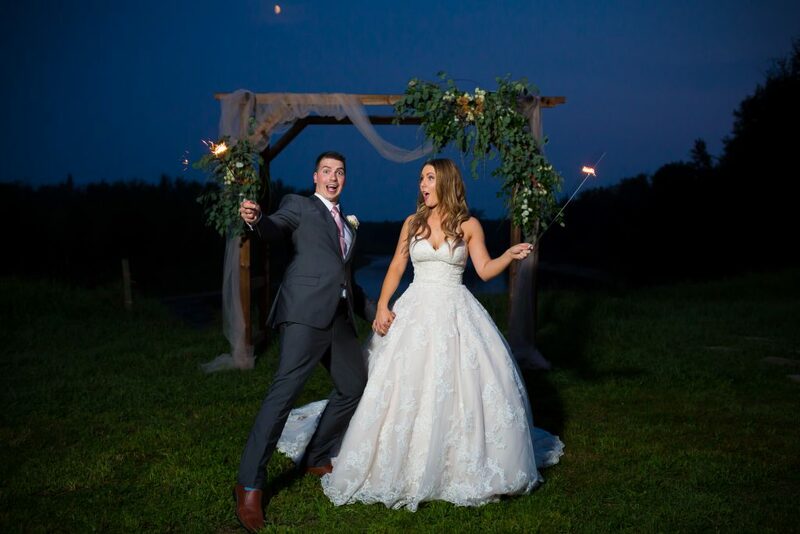 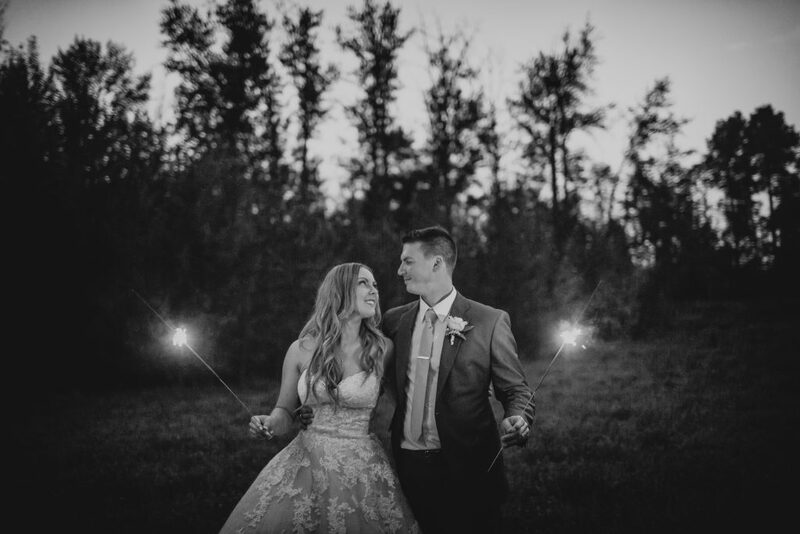 To end the night, Raymond and Lierin celebrated with some sparkler wedding photos! 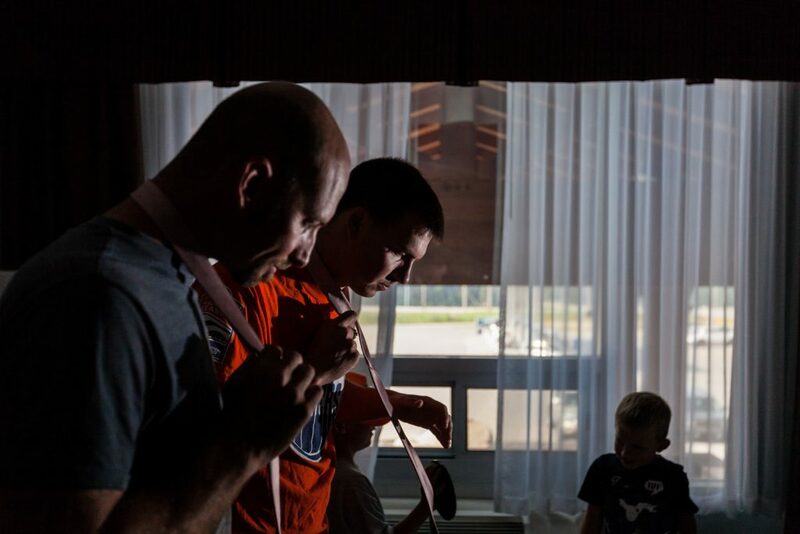 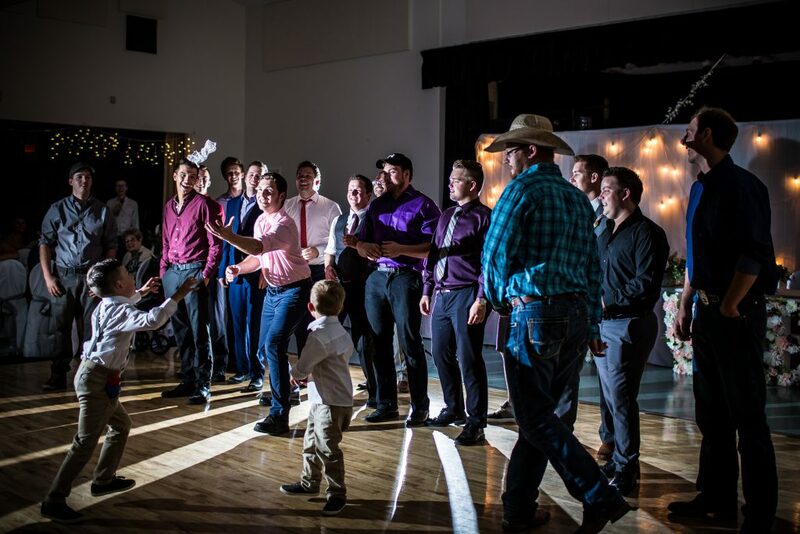 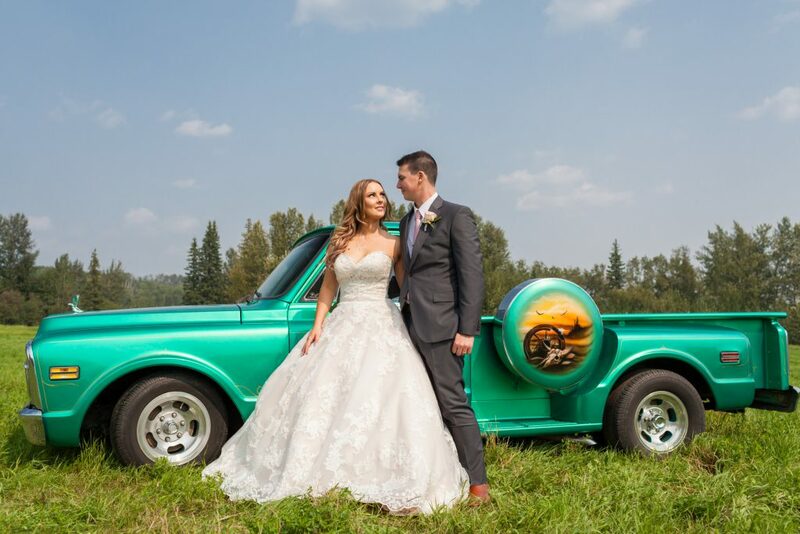 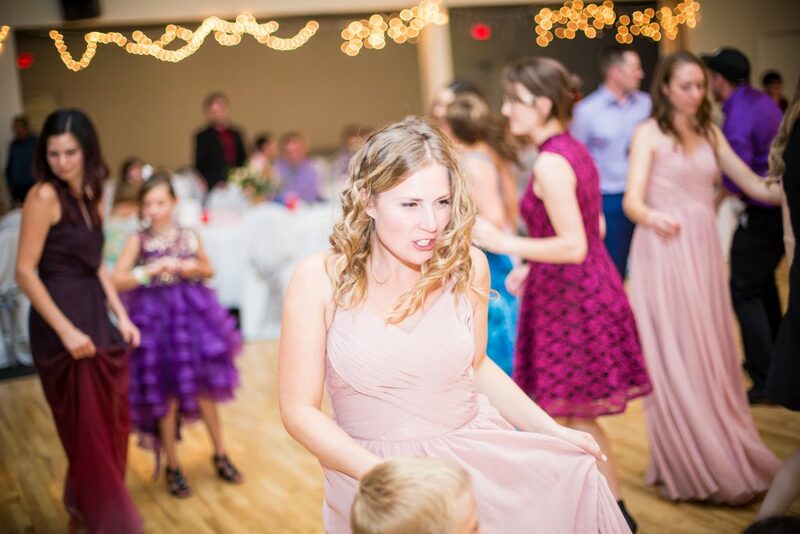 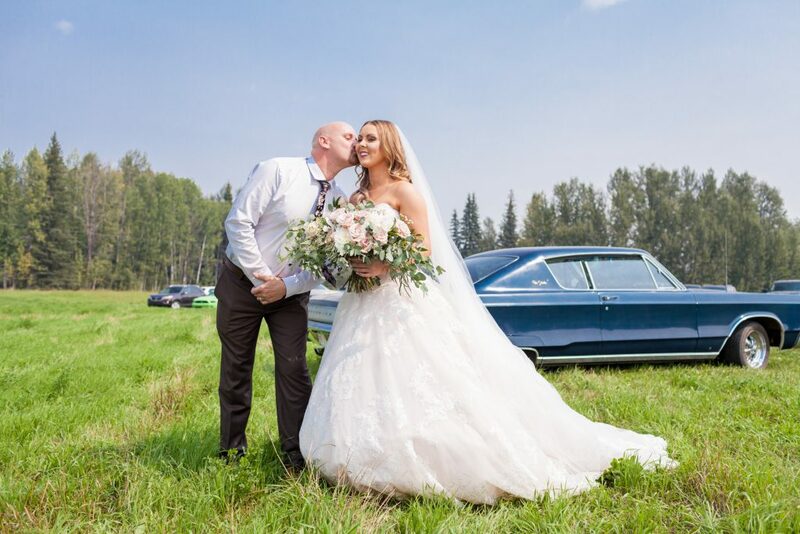 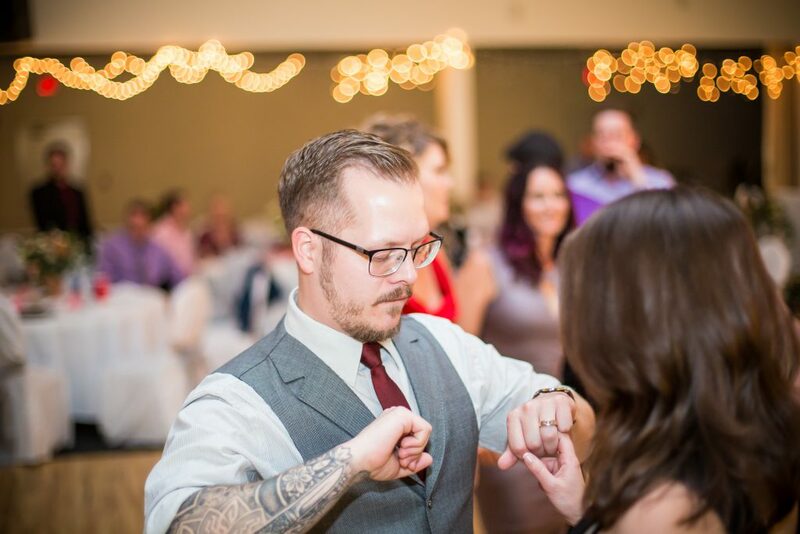 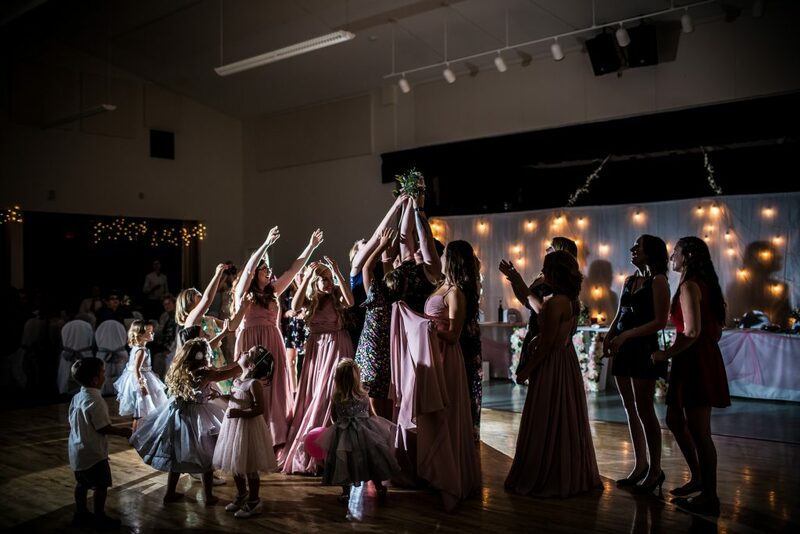 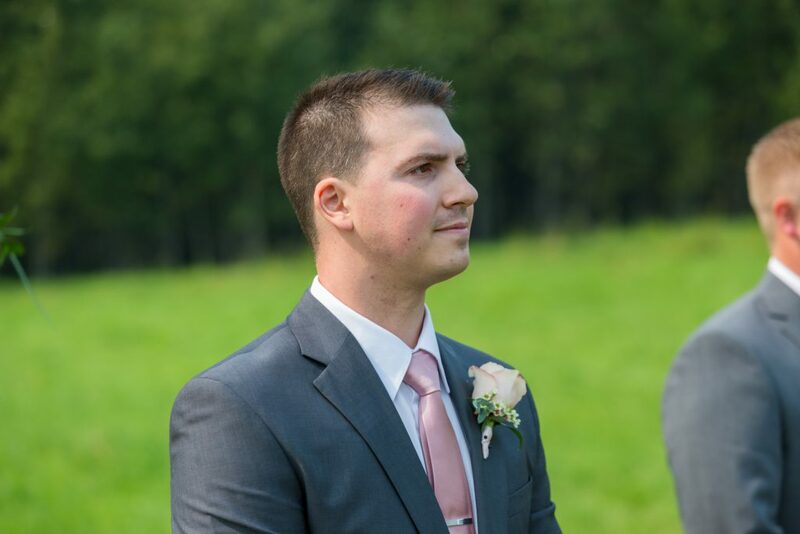 Thank you for inviting Deep Blue Photography to capture your beautiful Whitecourt country wedding!